Villa Madeira è il Resort di vacanza perfetto della Florida! Il condominio 501 è situato nell'angolo sud-ovest dell'edificio. Situato a pochi minuti da St. L'aeroporto di Petes / Clearwater, Villa Madeira, si trova nel centro delle principali attrazioni della Florida: Epcot Center, Walt Disney World e Busch Gardens. Il condominio di vacanza dispone di tre passeggiate a un ampio 60 piedi di baldacchino a forma di 'L'. Il balcone si trova nell'angolo sud-ovest che vi offre pieno sole dalla mattina al bel tramonto. Il condominio si trova al 5 ° piano di un edificio di 6 piani. Questa unità si affaccia sul Golfo del Messico, una piscina riscaldata con acqua salata, situata proprio sotto il balcone, un'enorme spiaggia di sabbia bianca e pulita, acque poco profonde e un bel tramonto. Questo condominio ad angolo offre un'esperienza meravigliosa per tutti nella tua famiglia. Siamo spiacenti, gli animali non sono ammessi. La camera da letto principale ha un letto king-size, una doppia vanità, una nuova cabina doccia, un HD TV via cavo e un salotto privato sul balcone. La seconda camera ha due nuovi letti singoli XL e un bagno completo adiacente. La terza camera da letto separata ha un letto matrimoniale. C'è anche una dimensione regina far saltare in aria. Per la vostra sicurezza ci sono barre di manovella in entrambe le vasche. Il soggiorno è confortevolmente arredato con due nuovi divani in pelle reclinabile. Con un cavo da 47 pollici grande schermo HD TV, VCR, STEREO, DVD e un telefono con una segreteria telefonica. Avete anche un posto di parcheggio privato e coperto dalla lobby di sicurezza. Ci sono porte di sicurezza alla piscina e alla spiaggia. C'è anche un seggiolone per bambini e box / dorme nel condominio. We reserved this condo for March 9 to March 16, 2019. Upon arrival we found that the condo is not in the condition advertised and was very dirty. We found lots of hair in the drawers in the master bath vanity. The drawers in the master bedroom had dead insects in them. The carpets in all three bedrooms were very dirty. The furniture on the lanai was also very dirty and looked like it hadn’t been washed down in the recent past. When we checked the beds we found urine stains on the sheets in the master bedroom and the twin bed sheets appeared to have been slept in and not washed since the previous guests had left. The second bathroom has not been updated and is in very poor condition. So much so that we cancelled scheduled guests. We contacted the owner directly and he had the cleaning company contact us. By that time ( late the next day) we had washed the master bedroom sheets four times to remove the urine stains plus had cleaned drawers and the lanai furniture. The cleaning company gave us t.he excuse that the previous renters had left the condo in extremely dirty condition and offered to send the cleaner back to do what we needed. We left a day early and notified the cleaning company so that they could do additional cleaning. When our damage deposit was returned there was no additional consideration given for the work that we had to put in to make the condo somewhat livable. We have stayed at Villa Madeira multiple times and have always had a good experience. This condo does not measure up to the others that we have stayed in. We really enjoyed our time in Gid Aballe’s Villa Madeira unit. The condo has everything you need for a beach vacation and Gid even provides most, if not all, of the consumable supplies as well, which most rentals do not. Our group of six included two children. There was room for all and everyone had a good time playing on the beach or in the pool or just relaxing on the wonderful screened in porch that spans two sides of the unit and has seating for 12. Villa Madeira is an easy walk to John’s Pass and all the shops and restaurants there, as well as just across the street from the long-standing landmark, The Candy Kitchen, and other local eateries such as Lisa’s Café and Sweet Brewnette. We had one issue on arrival. Water was leaking into the ceiling light in master bath. We called Gid and he immediately checked into it and all was fixed by the following afternoon. I would definitely love to stay in this unit again and highly recommend Gid and this property for anyone considering a stay at Madeira Beach. 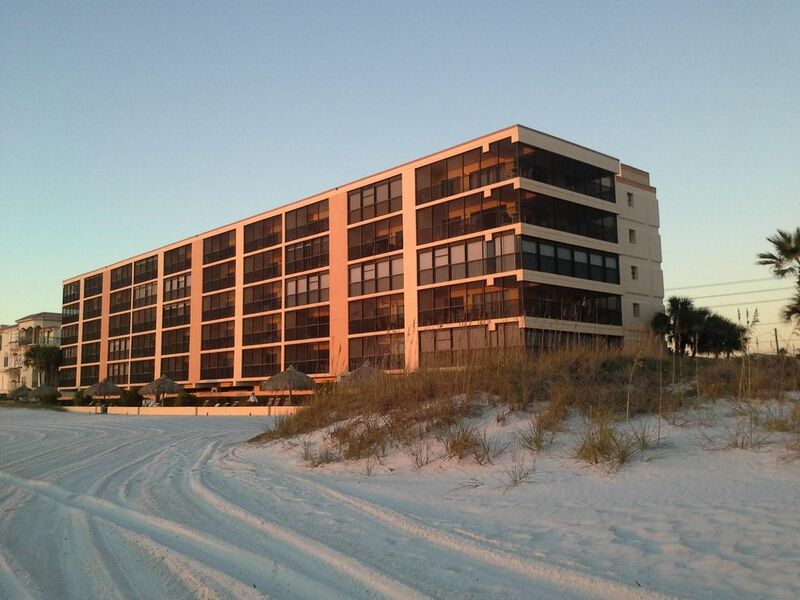 Madeira Beach is a stunning beach with plenty of attractions close to this condo. Overall we were very happy with the condo, comfortable beds, clean bed linen and a stunning location. It has a fabulous balcony that wraps around the side so plenty of room for the kids to play while you sit taking in the amazing views. Gid the owner was quick to respond when we had problems. The condo itself is being let down by the cleaning company with lots of small issues not being addressed. This really is a shame as Gid is a lovely caring person and wants his guests to have the best time. Would we stay there again ....yes because I’m sure the small issues we encountered will be addressed now Gid knows about them. Oh and thanks Gid for the reassuring phone call too. Final week of our Florida holiday. Weather great tho'a little too hot! Great situation with lovely views along beach. Only 15 min. walk along beach to John's Pass. Condo nice but is needing some TLC. Some problems with a/c, broken bathroom sink stopper / cracked mirror. Someone needs to check dishes are washed properly. A bit more care and attention would make it perfect. Thanks for the information. We have addressed the issue that are the reasonability of the cleaning staff. The other concerns will be looked after shortly. I am glad that you enjoyed the condo and the view. It was nice, We liked being right on the beach. Everything in the condo was fine with the exception of the queen bed. The mattress was so uncomfortable it was not able to be slept on. This was more than a bit of an inconvenience. I would suggest they replace the mattress and possibly box springs before renting again. We loved the area and the sunsets were wonderful. Thank you for the information ... I appreciate the feedback and will address this concern. Glad you enjoyed being on the beach! Wow! This condo is amazing! This condo was impressive! Everything you need is right there. The kitchen is stocked, the living room furniture is leather and motorized, the master bedroom mattress is unbelievably comfortable and the shower is wonderful. The view is peaceful! The unit is spotless, it would have passed my mom’s white glove test! The building is very well maintained with beautiful landscaping. Don’t hesitate to book with Gid, he quickly responds to all questions and couldn’t be any kinder. I can’t wait to book again next summer!